HEAD: Big, pillowy, off-white and long-lasting. LACING: Excellent, as you would expect from a cask. NOSE: Very fruity and even more spicy. Loads of clove, bananas, unripe green apples and an undercurrent of yeast and bread dough. Very little hop presence. TASTE: A little sweeter and spicier than other Saisons. More like a Belgian Golden Ale. Clove, coriander, apples, and bananas all floating on a bed of soft, warm, biscuits. A hint of alcohol makes the finish a touch drying and bitter. I suspect the cask improved the flavor immensely, but all I can do is judge based on what I was served. I’m sure a bottled version would be very different. MOUTHFEEL: As with all good cask-conditioned beers, the mouthfeel is frothy, creamy, and smooth. It’s a medium-bodied brew…not heavy in the slightest. DRINKABILITY: First of all, props for naming this beer after a well-known maritime verse that brought back memories from the halcyon days of my youth (like Doc and Suday, I grew up in a small ocean-side town in New England). The verse begins “Red sky at night, sailor’s delight / Red sky at morning, sailor’s take warning.” What’s it mean? I have no idea. And what does it have to do with drinkability? Absolutely nothing. But I like the name so the beer gets a ratings boost for that. In truth, this may not be a great Saison, but the cask-conditioning mellows out all the rough edges and leaves a nice, drinkable brew. 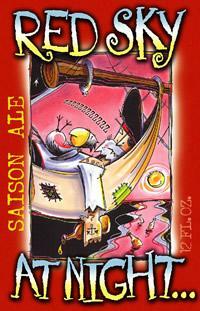 Posted in Tasting Notes.Tagged Heavy Seas, Red Sky at Night, RFD, Saison, Washington DC. Judeo-Christian-Elizabethan weather lore notwithstanding, in this context I take it as a subtle reminder that drinking a 3-hop saison at night is delightful, but drinking a 3-hop saison with breakfast may lead to a very eventful morning commute. Wisdom to live by.